Crytek knows that people are cheating in the multiplayer demo for Crysis 2 but says it won't be so easy to get away with those shenanigans in the full game. If there's one thing you can count on in online gaming, it's cheating. There will always be those for whom "fun" can apparently only be achieved through victory at any cost, even if that means using hacks and exploits to give themselves an unfair advantage over the competition. So what if it screws things up for everyone else? The important thing is that you look good to strangers on the internet who don't know about your dirty tricks. But Crytek knows what you've been up to and it's not going to stand for it. "We know that some people have been playing with an unfair advantage in the Crysis 2 demo," the studio wrote on the Crysis 2 blog. "Rest assured that although the demo does not have these features installed, our team has been working for some time on various anti-cheat measures that have been introduced for the retail release of Crysis 2. We would like to make sure everyone is aware of how important this issue is to us, and that we will continue to strive for a cheat-free community with Crysis 2." It's not exactly a surprise, since most online games make use of some form of anti-cheat technology these days, but still no doubt a reassurance for gamers worried that the final game would be as wide open as the demo. 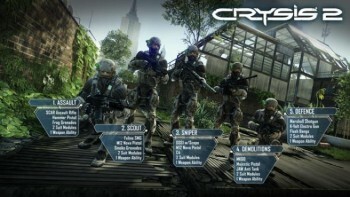 Crysis 2 comes out on March 22 for the PC, Xbox 360 and PlayStation 3.